The ecliptic and its relation to rotation axis, plane of orbit and axial tilt. The ecliptic is the apparent path that the Sun traces out in the sky during the year. As it appears to move in the sky in relation to the stars, the apparent path aligns with the planets throughout the course of the year. More accurately, it is the intersection of a spherical surface, the celestial sphere, with the ecliptic plane, which is the geometric plane containing the mean orbit of the Earth around the Sun. The name "ecliptic" is derived from being the region where eclipses occur. The plane of the ecliptic is well seen in this picture from the 1994 lunar prospecting Clementine spacecraft. Clementine's camera reveals (from right to left) the Moon lit by Earthshine, the Sun's glare rising over the Moon's dark limb, and the planets Saturn, Mars and Mercury (the three dots at lower left). The ecliptic plane should be distinguished from the invariable ecliptic plane, which is perpendicular to the vector sum of the angular momenta of all planetary orbital planes, to which Jupiter is the main contributor. The present ecliptic plane is inclined to the invariable ecliptic plane by about 1.5°. 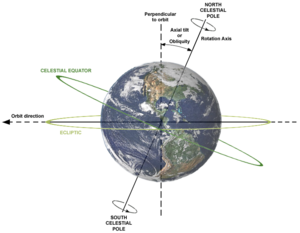 As the rotation axis of the Earth is not perpendicular to its orbital plane, the equatorial plane is not parallel to the ecliptic plane, but makes an angle of about 23°26' which is known as the obliquity of the ecliptic. The intersections of the equatorial and ecliptic planes with the celestial dome are great circles known as the celestial equator and the ecliptic respectively. The intersection line of the two planes results in two diametrically opposite intersection points, known as the equinoxes. The equinox which the Sun passes from south to north is known as the vernal equinox or first point of Aries. Ecliptic longitude, usually indicated with the letter λ, is measured from this point on 0° to 360° towards the east. Ecliptic latitude, usually indicated with the letter β is measured +90° to the north or -90° to the south. The same intersection point also defines the origin of the equatorial coordinate system, named right ascension measured from 0 to 24 hours also to the east and usually indicated with α or R.A., and declination, usually indicated with δ also measured +90° to the north or -90° to the south. Simple rotation formulas allow a conversion from α,δ to λ,β and back (see: ecliptic coordinate system). The ecliptic serves as the center of a region called the zodiac which constitutes a band of 9° on either side. Traditionally, this region is divided into 12 signs of 30° longitude each. By tradition, these signs are named after 12 of the 13 constellations straddling the ecliptic. The zodiac signs are very important to many astrologers. Modern astronomers typically use other coordinate systems today (see below). The position of the vernal equinox is not fixed among the stars but due to the lunisolar precession slowly shifting westwards over the ecliptic with a speed of 1° per 72 years. A much smaller north/southwards shift can also be discerned (the planetary precession, along the instantaneous equator, which results in a rotation of the ecliptic plane). Said otherwise the stars shift eastwards (increase their longitude) measured with respect to the equinoxes (in other words, as measured in ecliptic coordinates and (often) also in equatorial coordinates). Due to perturbations to the Earth's orbit by the other planets, the true Sun is not always exactly on the ecliptic, but may be some arcseconds north or south of it. It is therefore the center of the mean Sun which outlines its path. As the Earth revolves in one year around the Sun, it appears that the Sun also needs one year to pass the whole ecliptic. With slightly more than 365 days in the year, the Sun moves almost 1° eastwards every day (direction of increasing longitude). This annual motion should not be confused with the daily motion of the Sun (and the stars, the whole celestial sphere for that matter) towards the west in 24 hours and along the equator. In fact where the stars need about 23 hours, 56 minutes, for one such rotation to complete, the sidereal day, the Sun, which has shifted 1° eastwards during that time needs four minutes extra to complete its circle, making the solar day just 24 hours. Because the distance between Sun and Earth varies slightly around the year, also the speed with which the Sun moves around the ecliptic is variable. For example, within one year, the Sun is north of the equator for about 186.40 days, while it is 178.24 days south of the equator. The mean Sun crosses the equator around March 20 in the vernal equinox, its declination, right ascension, and ecliptic longitude are all zero then (the ecliptic latitude is always). The March equinox marks the onset of spring in the northern hemisphere and autumn in the southern. As such the term "spring equinox" should be avoided. The actual date and time varies from year to year because of the occurrence of leap years. It also shifts slowly over the centuries due to imperfections in the Gregorian calendar. Ecliptic longitude 90°, at right ascension six hours and a northern declination equal to the obliquity of the ecliptic (23.44°), is reached around June 21. This is the June solstice or summer solstice in the northern hemisphere and winter solstice in the southern hemisphere. It is also the first point of Cancer and directly overhead on Earth on the tropic of Cancer so named because the Sun turns around in declination. Ecliptic longitude 180°, right ascension 12 hours is reached around September 22 and marks the second equinox or first point of Libra. Due to perturbations to the Earth orbit, the moment the real Sun passes the equator might be several minutes earlier or later. The southern most declination of the sun is reached at ecliptic longitude 270°, right ascension 18 hours at the first point of the sign of Capricorn around December 21. Most planets go in orbits around the sun which are almost in the same plane as the Earth's orbital plane, differing by a few degrees at most. As such they always appear close to the ecliptic when seen in the sky. Mercury with an orbital inclination of 7° is an exception. Pluto, at 17°, was previously the exception until it was reclassified a dwarf planet, but other bodies in the Solar System have even greater orbital inclinations (e.g. Eris 44 degrees and Pallas 34 degrees). The intersection line of the ecliptical plane and another planet's orbital plane is called the nodal line of that planet, and the nodal line's intersection points on the celestial sphere are the ascending node (where the planet crosses the ecliptic from south to north) and the diametrically opposite descending node. Only when an inferior planet passes through one of its nodes can a transit over the Sun take place. Up to the seventeenth century in Europe, starmaps and positions in star catalogues were always given in ecliptical coordinates though in China, astronomers employed an equatorial system in their catalogues. It was not until astronomers started to use telescopes to measure star positions that equatorial coordinates came in use, and so exclusively that nowadays ecliptical coordinates are no longer used. This is not always desirable. 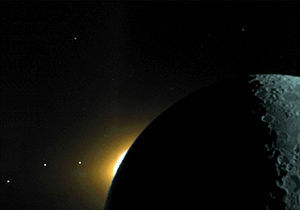 A planetary conjunction for example would be much more illustratively described by ecliptic coordinates than equatorial. ↑ Jean Meeus, Mathematical Astronomy Morsels (Richmond, VA: Willmann-Bell, 1997, ISBN 0943396514). ↑ United States Naval Observatory, Earth's Seasons: Equinoxes, Solstices, Perihelion, and Aphelion, 2000-2020 Retrieved October 12, 2015. The Path of the Sun, the Ecliptic NASA. This page was last modified on 25 September 2017, at 22:19.